When Rachel Dolezal was forced to step down from the presidency of the local branch of the NAACP in Spokane, Washington in 2015 because she was not (as she had claimed) African-American, it spurred a debate on the nature of race and cultural appropriation which was long past due. Yet, playwright Henry David Hwang had already addressed the issue, and with a minority population which if anything is even more likely to face casual appropriation, in “Yellow Face,” which had its premiere in Los Angeles in 2007. From the era of Charlie Chan, played by white actors from Warner Oland to Peter Ustinov, to the upheaval in Actors Equity in the 90s over the use of a white British actor as the central character – a Vietnamese – in “Miss Saigon,” Hwang points to the inequity of giving Asian roles to white performers. This even as he underscores how easy it is to convince those who want to be convinced that the false Asian is, indeed, real. The production, itself a revival of a coproduction with Firescape Theatre in San Francisco, is even more bare-bones than the original, with all the actors seated in a row on the stage, most then becoming several different people over the course of the play. Essentially, the show posits what would happen if a playwright of Hwang’s prominence misled the public, for a lot of internal reasons, into thinking a purely white actor is of Asian descent, and then that actor runs with the idea far enough to begin becoming an Asian entertainment icon. This tale is then juxtaposed against Hwang’s very real wrestling with his banker father’s misconceptions about western business practices – ones which lead to the father’s downfall as his Far East National Bank becomes embroiled in investigations into possible Chinese influence-peddling. Still, the power in this play comes from its humor as well as its poke at social responsibility, and the quality of the performers who make the whole thing come to life. Jeffrey Sim is Hwang himself, both the narrator and protagonist of the piece. Sim’s tight comic timing, and his casual humanity keeps the play both serious and very funny, sometimes at the same moment. Roman Moretti, as the actor who discovers his calling in being someone he is not, is just handsome enough, with just vague enough ethnic markers to make his role work – a role he handles in a straightforward, even earnest way which keeps it from being innately insulting. Alfonso Faustino creates Hwang’s banker father, and a host of other entertainment and cultural figures, Jennifer Vo Le creates all of the play’s Asian women, from Hwang’s mother to his false creation’s girlfriend. 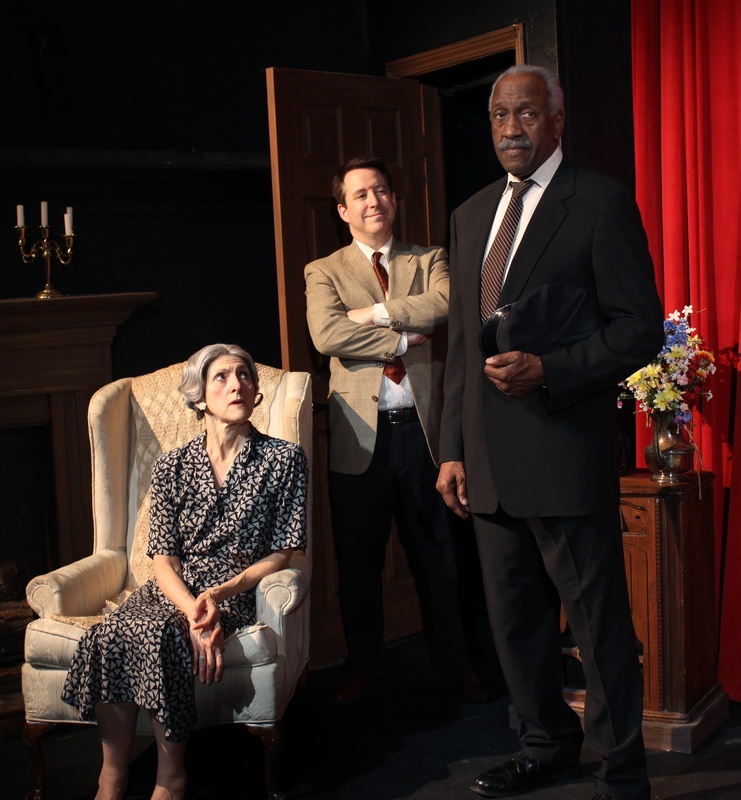 Lisagaye Tomlinson handles a startlingly varied collection of other characters, making each impressively individual, while Dennis Nollette does the same as a broad spectrum of producers and politicos, some of them quite recognizable. John Pendergast, in the smaller but profoundly essential role of an actual, though elaborately unnamed New York Times reporter, carries his character’s nonjudgementalism with a somewhat sinister air. “Yellow Face” remains profound, even as it also remains very humorous. It’s theme underscores one of the last seemingly acceptable cultural appropriations (remember the controversy over Scarlett Johansson’s voicing of a character in The Ghost in the Shell series), and – albeit with humor – claims identity as an important aspect of the 21st century entertainment sphere. Now at Candlelight Pavilion Dinner Theater in Claremont, it is indeed done well, and the result is a rollicking delight, made only that much better by the Candlelight Pavilion’s traditionally tasty meal. The tale is now part of the American canon: Don Lockwood and Lina Lamont, silent screen heartthrobs, are caught in a conundrum when talkies suddenly arrive, thanks to Lina’s less than glamorous pipes. Enter Kathy Seldon, an aspiring actress Don is attracted to, who can sing up a storm. What will be her role? Will “Lockwood and Lamont” survive? And what will be the role of Don’s comedic best buddy Cosmo, in the new world of movie music? Director/Choreographer DJ Gray has adapted the great dance numbers, many of them created by Gene Kelly, to the Candlelight stage – a brilliant move, creating the reminiscence which is part of the musical’s charm. The performers, from chorus to stars, dance up a storm, and have the energetic verve which propels this kind of production. Wesley Alfvin leads the cast as Lockwood, cutting a handsome figure, singing convincingly, and dancing well enough to make Kelly proud. Andrew J. Koslow, as Cosmo, handles the difficult comic “Make ‘Em Laugh” with aplomb, even if some of the pratfalls are made awkward by the sheer necessity of movable set pieces. As Kathy Seldon, Colette Peters keeps up with the two guys on the dancing front, and sings respectably, but Krista Curry all but steals the show as Lina, producing a voice which can only be compared to fingernails on a blackboard. John Nisbet brings both kindness and fluster to the head of the studio, while Brandon Kallen flings about appropriately as the director also forced to change styles with the advent of sound. Still, in many moments the real stars are the members of the versatile ensemble, playing small parts, providing background or supporting song-and-dance folk, and generally setting the tone for the entire piece. Kudos go to music director Douglas Austin for finding the sound of early talkies, and getting the most out of those classic tunes. A nod also to Mitch Gill, whose set proves agile enough to keep the story rolling, and yet incorporate all the many and varied settings (and demands of some of the signature production numbers). Yes, it actually rains, and yes, if you sit right by the stage you may get wet. “Singin’ in the Rain” was never a wildly deep story, but rather a chance to celebrate some of the best of what classic movie musicals were about: songs, dancing, romance, and fun. If that calls to you, then go see this production. Candlelight Pavilion shows, at their best (and their recent shows have often been among their best ever) can be a welcome respite from the complexities and uncertainties of the workaday world. And you eat well. Farces, as a general rule, are hard to kill. Some evoke chuckles, some evoke laughter, and a very few regularly bring an audience into a state of howling laughter. Of this last category, one of the best is Michael Frayn’s “Noises Off,” a wild send-up of the theater itself. From start to finish it contains memorable characters, ridiculous situations, and furious timing, which work together to make one of the great, lighthearted comedies in the modern theater. At A Noise Within some of the resident company’s best performers have gathered to give this silly, wonderful thing the finesse it deserves. The results are everything one could hope for: clever and beautifully timed, and solidly funny from start to end. The play’s premise is very simple: a second-class provincial theatrical company, underrehearsed and full of interpersonal drama, is about to embark on a tour. We meet them during the final dress rehearsal, and that’s about as close to what the play should look like as one will get. From there we look at the show, literally from back to front, as the internal dramas and inadequacies begin to take over. Geoff Elliott leads the cast, giving the fatalistic director of the play-within-this-play a real-ness which is absolutely necessary for the comedy to work. Indeed, that is what makes this comedy so funny – everyone onstage is playing it straight, even when their characters are ridiculous. Deborah Strang has a ball as the rather vacant, aging star, Kasey Mahaffy proves wonderfully fresh as the most inarticulate of the cast members, and Emily Kosloski does the classic airhead with remarkable focus. But the good news doesn’t stop there. Jeremy Rabb makes his character’s fragility funny, Jill Hill gives the company’s gossip style and limited patience, and everyone works to keep Apollo Dukakis’ rather dim character off the sauce. Erica Soto plays the beleaguered stage manager, while Rafael Goldstein is the everything-else the company depends on, always on the verge of exhaustion. Everyone plays their parts to the hilt, but with the strong sense of ensemble absolutely necessary for this crazy piece’s elaborately intertwining gags to work. Elliott, along with fellow artistic director Julia Rodriguez-Elliott, has directed this whole piece with an obvious love for both the play and the participants. As a result, the thing is simply fun. Truly fun, from start to finish. Kudos also to Fred Kinney for the ridiculously impossible set – full of doors which could not possibly be that close together – which looks good from back as well as front. Indeed, some of the show’s stars are the stage crew who shift the set from front to back to front with precision. Costumer Angela Balogh Calin has each performer looking just a tad overdone, as the play requires. It all works. If you are looking for pure entertainment, you won’t find anything more satisfying than “Noises Off,” particularly when done as well as on stage at A Noise Within. Go take a look before they sell out. If a play intends to use cultural references in the course of its work, it probably makes sense to be sure that the audience will catch a clue as to what those references are. Indeed, without the commentary by a staffer in the program for The Theatre@Boston Court’s production of Jen Silverman’s “Collective Rage: A Play in 7 Boops,” the play would lose much of its ability to make a point. As it is, assuming that people will understand the questionable content of early Betty Boop cartoons is a bit like assuming everyone knows that Barbie dolls are essentially copies of a 1940s “action figure” from an underground, sexually explicit German cartoon strip. Didn’t know that? You see my point. With that said, this examination of – one assumes – the way men think about women thinking about women has some fascinating moments as stereotype meets stereotype in reference to female sexuality. Indeed, the constant reference to the term Donald Trump used to describe female parts becomes elemental in the increasingly surreal storyline, as if it was the only thing that women value in themselves and others. The five characters are all named Betty Boop, and range (in sequential number order) from a bored socialite angry at her husband’s casual dismissal of her angst, to an isolated and ignored wife, to an ambitious if under schooled,overtly sexual cosmetic counter saleswoman, to a proudly butch lover of trucks, and finally an androgynous woman recently released from jail. What seems to become an overarching theme among them all is the adaptation they find necessary (well, except perhaps the saleswoman, who is busy trying to reinvent herself) to a male view of things. The more masculinely they can see themselves, the more they find power. But then, isn’t that the stereotypical male assumption about powerful women? What makes this work as well as it does is both the quality of ensemble, and the consistent vision of director Lindsay Allbaugh. Through projections, most of which create chapter headings for this extremely episodic tale, and the use of spare and thus easily repurposed set pieces, courtesy of Francois-Pierre Couture and properties designer Jenny Smith Cohn, the individual snapshots of dialogue and character development are woven together better than one might expect. As a group, Elyse Mirto’s socialite, Courtney Rackley’s mousy wife, Anna Lamadrid’s streetwise sexual being, Karen Anzoategui’s reliable pal, and Tracy A. Leigh’s practical ex-con weave their stories together with a remarkable precision, taking the often somewhat artificial dialogue in very human directions. Yet, whether this – in the end – leads to a coherent whole is something else again. The concept wants us to follow along as these five women are placed up against the predatory sexual attitude the males in the Max Fleischer films of the early ’30s showed toward Betty. Thus, what they apparently want is each other, and a masculine sense of entitlement, even as they constantly reframe that conversation. In the end, however, the resolutions seem trite rather than profound. If that is also to be a reflection on the cartoon which inspired it, one is left asking whether there is enough “there” (or even, as titled, rage) there to warrant attention. Of all of Tennessee Williams’ great plays, “The Glass Menagerie” remains the best known, showing up in high school English textbooks and even – back in the early 70s – bringing TV-shy Katharine Hepburn to the small screen. Perhaps what makes it so engaging is its semi-autobiographical nature. Perhaps it is the intense reality of its characters, and the sad yet open-ended conclusion. Whatever the reason, it has captured the imagination of generations of theatergoers. Now a new production at the Sierra Madre Playhouse offers up strong performances, evocative and atmospheric music, and a set and lighting design focused (as Williams wanted) on the fact it is a “memory play.” One choice of director Christian Lobano may fuzz focus at times, but in general this production offers a fine chance to see a great American classic. The play centers on Tom, who is both protagonist and narrator, and his view of his family. Tom lives with and supports his mother Amanda, a faded southern belle whose husband has long since wandered off. Her constantly replayed tales of youthful popularity and her inability to develop enough practicality to survive without the support of others prove maddening to Tom, as does her insistence that her daughter, the club-footed and profoundly shy Laura will one day be receiving “gentleman callers” just as her mother did. Pushed, Tom does invite to dinner a male friend from his uninspiring workplace, with complex consequences. The best thing in this production has to be the cast. Katherine James creates in Amanda the kind of conversational style obviously intended to cover an innate desperation, and the carriage of a woman trying to recapture a long-gone youth. Andrea Muller makes Laura fragile but not pitiful – a tough balancing act. Because she does this so well, Ross Philips’ gentleman caller can respond to her in ways which give her a warmth not always seen in productions of this play. Philips’ portrayal of Jim, the caller, balances the man’s own anxieties and optimism in ways which make his energy infectious. The play’s original score, composed by Jonathan Beard, gives the entire play a specific, interesting undercurrent. Erin Walley’s set design takes the original stage directions and adapts them beautifully to SMP’s far smaller stage, while Pablo Santiago’s moody, sometimes dim lighting underscore the thing as a piece of memory. Indeed, in this fine production, if there is one thing which could arguably use a second look, it would be Lobano’s decision to remove Tom to the spot of narrator more often and more intentionally than usual. In plays like “Dancing at Lughnasa” the narrator is always outside the frame. Even when speaking to characters in the story he does so from a distance, and he stands to one side as a constant observer. That distance is important to the storyline and the way that tale is told. The thing is, that concept doesn’t really translate to “Menagerie”. One must have Tom in the room with Amanda to feel his rising anger. And one must have Tom away and unobservant when elements central to the storyline – particularly Laura and her caller – evolve in ways Tom can’t expect. To have him standing to one side agonizing over his sister’s fate distracts from a fantastically important (and extremely well done) scene Tom should never have seen. That, and the caller’s callous (and unscripted) action in the aftermath muddy the thematic angle of the piece. Still, it says much about this production that one can nitpick a director’s choices. The entire performance has a clean and sharp quality which make it engaging from beginning to end. Most certainly, the strong characterizations carry the day. So, if you have never seen “The Glass Menagerie,” now is the time, and Sierra Madre Playhouse is the place. Go take a look. According to polls, nearly 80% of Americans don’t trust politicians very much. Sometimes the work they do may seem noble, but most of the time we have come to see those who lead our country, be they in Congress or the White House, as having rather remarkable feet of clay. As the hyperbole flies and the tension mounts toward this upcoming federal election, it’s good to take a moment and laugh at the idiocies of the lofty. And that is what you will do in David Mamet’s “November,” the new play at the Mark Taper Forum. There an admittedly abysmal president, with virtually no chance of reelection, swims in a sea of myopia, self-aggrandizement, and false hope, grasping alternatively at funding for his cash-poor library and for a deluge of last minute campaign media. The satire is biting. The farce hangs on the intertwined agendas of a politician of limited intelligence in panic mode. By comparison the real government isn’t half bad. 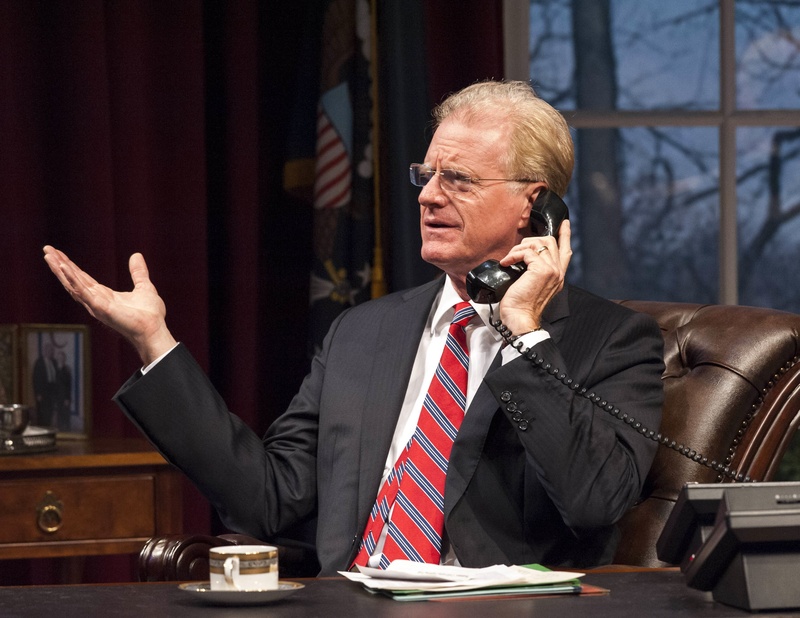 Ed Begley, Jr. leads the cast as President Charles Smith, whose approval rating is scraping the floor only a couple of weeks before the election. His funding has run out to such an extent he may have no legacy. His wife wants to take a White House couch home. His lesbian speechwriter has just returned from China with a baby, and wants to marry her partner. The guy from the turkey board wants him to pardon a turkey. And maybe, just maybe, if he can find the funding, he can end his campaign with a blitz of advertising which could keep him in office. Begley makes Smith hysterically funny, powering Mamet’s outrageously apt dialogue along at light speed. It’s 90 minutes with no intermission, but things fly by so quickly you simply don’t notice. Rod Mclachlan, as his chief of staff, provides the perfect counterpoint: just a hair slower to speak, trying to reason with a man in panic, but still a man who is too close to the situation to handle it well. Todd Weeks, as the geeky Representative of the National Association of Turkey and Turkey By-Products Manufacturers, balances obsequience and an internal logic which makes his contact with the president difficult to navigate. Felicity Huffman, as the speechwriter dragged into the room despite a horrible cold, becomes the picture of detachment and logic that crazed room. Gregory Cruz completes the picture as a Native American leader, angry over the president’s cultural insensitivities. All good farces must move at quite a clip. “November” is no exception. The dialogue is delivered by this ensemble with pinpoint timing, staying clear at a remarkable clip. The physical energy as people charge about has the audience nearly vibrating by the end, and consistently and humorously engaged. Of course, there are those who would be appalled (though, after the Nixon tapes, hardly surprised) to find out that the President of the U.S. cusses a blue streak behind closed doors. Or, indeed, that the President is as dim as Smith, or as self-absorbed. But this play does not represent itself as a mirror of anything except our tendency to assume politicians in general are probably less than they seem. And it’s funny – funny like any good farce. Ridiculous things happen and you laugh. Surprises are constant, and you laugh. That you get to laugh at the whole idea of a President and campaigning is a gift Mamet and the Taper have given to a weary electorate. Taking a look at this will make even the antics of the upcoming debates seem calm and reasonable. Shortly after “The Mikado” became the greatest hit of their career, the duo of William S. Gilbert and Arthur Sullivan took on a Halloween-esque story to make fun of melodrama: “Ruddigore.” Though this work was one of Gilbert’s favorites, the show laid a comparative egg, and didn’t really find a life until significantly later. This despite a delightful score, in some places reminiscent of classic horror film music. Surprisingly, then, “Ruddigore” has stood the test of time right along with other Gilbert and Sullivan masterpieces. Its ridicule of the cardboard characters of melodrama, and its use of ghosts and curses make it fun to watch, even in modern times. Indeed, in the new production at the Sierra Madre Playhouse, it has been modernized: reset on the central California coast in the classic horror film era of the late 1950s, as if Hearst’s Castle was an actual home to a baronet. Oddly, for all the anachronisms, it works. The tale is as silly as most Gilbert and Sullivans. A long-ago curse has left the inheritor of Murgatroyd Castle with a terrible fate: he must either commit a crime every single day or die in agony. To avoid this, young Ruthven Murgatroyd has faked his own death and joined the villagers as a poor but earnest law student named Robin. In his absence, his younger brother Despard has become the fated villain. As Robin shyly falls for Rose, who uses a book of Emily Post to order her world, the handsome sailor Richard Dauntless threatens to sweep Rose off her feet. From here it just continues to tangle. Absolutely essential in any Gilbert and Sullivan are suitably trained voices, particularly for the leads. Maria Elena Altany all but vibrates with innocence and naivete as Rose, and sings like an angel. Nick Molari has just the right geeky niceness to make Robin sweetly shy and anxiously good, and also handles his songs with style. Richie Ferris gives Despard the essence if villainy, right down to the sneer, while Catherine Leech makes his former love, Mad Margaret, just creepy enough. As the comparatively swashbuckling Richard, James Simenc also sings with authority and makes his character lovably colorful. Michelle Holmes turns the standard “older woman” part into a great cocktail-wielding stereotype, which sets a needed tone. All these folk are backed by a small but charming chorus who play townspeople, scary spirits and even some of the Murgatroyd ancestors walking out of their portrait frames. There are some interesting choices in this production, on the part of the director. First, for much of the production the background is a projection made to look like grainy amateur film of the era. It sets a tone, but can sometimes distract some. Music Director Jennifer Lin plays piano for the singers, but much of the strictly orchestral moments revert to a taped orchestral version. This jumping back and forth works better than one would think. Nods go to Matthew G. Hill, designer of the set and the videos which accompany them, for creating a strong sense of place on a budget. Nods also to costumer Jeanine Lambeth Eastham for getting the silhouettes right. It seems, on the one hand, an odd choice to take something so elementally Victorian as Gilbert and Sullivan and shuffle it onto another continent and another time frame. Yet, it is also rare to get to look at a classic piece anew, and this “Ruddigore” has a lot of to recommend it, especially the talent of its leads. If you can overlook the more peculiar anachronisms (a 50s sailor discussing sailing ship battles, a nobleman in a California castle, or even a surfer of that era with a short board), and relax into the silliness, the music will carry the day. This year, so far, has been pretty rough. Just as the knee recovers, I have acquired what is commonly called walking pneumonia. Sorry I’m slow with some of the reviews. I hope to pick up the pace soon.